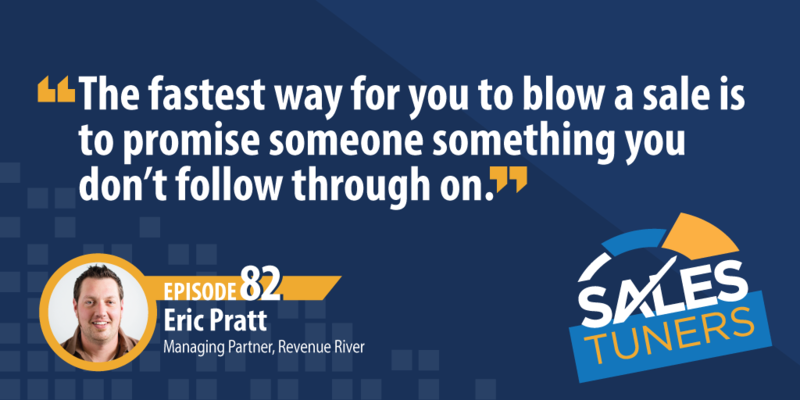 Eric Pratt (@eric_pratt), Best Selling Author and Managing Partner at Revenue River, works to help companies win online. Although he didn’t set out to be in sales, Eric has spent the last 20 years selling something to someone. Starting out Eric worked in the service industry, largely in sales support. His desire to win sparked after being turned down for a promotion. Since then, he’s been on a mission fueled by the thrill of victory where everyone wins. He believes every person in an organization is essential to the sale. If you’re a sales rep, it’s important to look within your company to work as a team instead of operating on an island. For Eric, the key to being successful in sales is your mindset. In a world of distraction, the challenge we tend to face is a lack of focus. The reward comes from hard work and having the mentality to make yourself better even on your own time. Buyers Can be Miseducated: While a lot of research can be, and is being, done prior to your first conversation with a buyer, it doesn’t mean they know exactly what they’ve made the right assumptions. While they’re clearly looking for something, it’s your job to be a helpful expert and advisor to the process. Dig Deeper: It’s very important to understand the existing state of a prospect’s business. Where are they? What do they already have to work with? What can you leverage? Buyers aren’t looking for you to tell them everything they want to hear, they’re looking to you for understanding. But how can you understand, if you haven’t asked enough questions? Don’t Leave a Mess for Delivery: Just because you’ve got ink on a contract, doesn’t mean your job is done. Help yourself by making the client handoff to fulfillment as smooth as possible. As a salesperson, every once in a while you’re going to have to do something where you are pitted between meeting a prospect’s demands and meeting or working within your companies structure and constraints. Taking care of delivery assures you can ask for favors when needed.